'Noise Models' are computer programs that can be used to assess environmental impacts caused by many aspects of aircraft and their operations such as fleet mix, runway use, flight procedures etc. 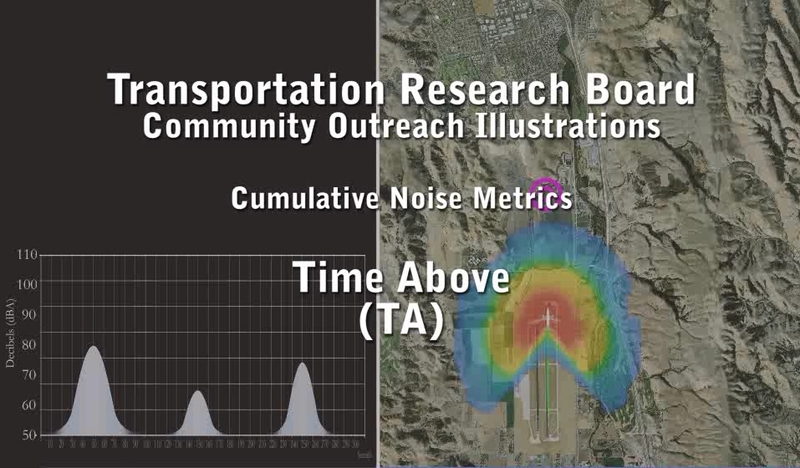 For noise analysis in the vicinity of an airport, the FAA uses the Integrated Noise Model (INM). For more information, see the FAA website. Calculations that express the effect of noise are called 'Noise Metrics'. The Integrated Noise Model (INM) has been utilized by the FAA since 1978. It has gone through several different versions over the years. The current version is INM7.0d service update 1 (released on September 24, 2013). INM was used for environmental assessments and noise impact studies in the vicinity of an airport. It has been replaced by the Aviation Environmental Design Tool (AEDT) as of May 2015. This version is in compliance with current international standards. FAA's AEDT development team has compiled an AEDT document with comparisons between INM and AEDT (including graphics). The document can be viewed at: AEDT and Legacy Tools Comparison. The FAA's Aviation Environmental Design Tool (AEDT) is a new software tool which combines existing noise and emissions models to evaluate how noise and emissions affect each other. The AEDT provides insights into the interdependencies between noise, emissions, air quality and fuel consumption. This has use at local, regional, national and international levels. As an example, it could be used to assess the environmental benefits of changes to the air traffic management system. The latest version of AEDT is AEDT Version 2b service pack 2, released on December 22, 2015.
Who supports the development of AEDT? This is a joint effort between the US government (FAA and NASA), industry, and academic researchers from the ASCENT/PARTNER FAA Centers of Excellence. The tool was developed in coordination with foreign agencies through the International Civil Aviation Organization (ICAO) Committee on Aviation Environment Protection (CAEP) and SAE Committee A-21 "Aircraft Noise Measurement and Aircraft Noise/Aviation Emission Modeling". The 2004 Report (PDF) to the U.S. Congress on Aviation and the Environment recommends that "the nation should develop more effective metrics and tools to assess and communicate aviation's environmental effects." This set of software tools allows for an evaluation of the environmental effects of aviation. These include aviation-related noise and emissions, impacts on health and welfare, and industry and consumer costs, under different policy, technology, operational, and market scenarios. The AEDT tool set combines and replaces five legacy noise and emissions models and helps assess interdependencies. These legacy tools are the Emissions and Dispersion Modeling System (EDMS), Integrated Noise Model (INM), Noise Integrated Routing System (NIRS), System for Assessing Aviation's Global Emissions (SAGE) and Model for Assessing Global Exposure to the Noise of Transport Aircraft (MAGENTA). The AEDT provides insights into the relationship between noise, emissions (including different types of emissions), air quality and fuel consumption. This has use at local, regional, national and international levels. As an example, it could be used to assess the environmental benefits of changes to the air traffic management system. The AEDT provides the predicted noise impact at specified points of interest or in noise contours. A common noise descriptor used in AEDT is Day Night Average Sound Level (DNL). DNL represents the accumulated noise level over 24 hours with a penalty of 10 dB given to operations taking place at night between 10pm and 7am. DNL is often displayed in noise contours. Each contour line represents a constant level of DNL, such as 75dB, 70dB, 65dB etc. The DNL 65dB contour is larger than the DNL 70dB contour and so on. Airports and the FAA use these DNL contours to determine where there is need for noise mitigation practices, such as home insulation programs. INM can also help evaluate the noise impact from new flight procedures, new runways, runway extensions, or airport zoning. The Noise Integrated Routing System (NIRS) is a tool used to assess aviation noise over broader areas. The NIRS is typically used with other Air Traffic modeling systems to analyze and determine routes, events, and air traffic procedures. 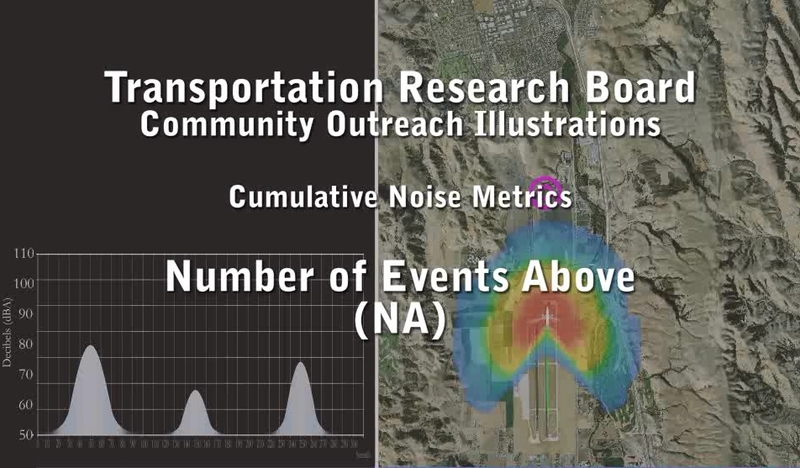 The NIRS provides change-of-exposure reports and population impacted by the noise. A set of rules based on FAA guidance and local requirements are then used to determine if an airspace alternative is likely to be controversial. The program can even list the major source of the change of noise exposure. With that information, the air traffic planner can evaluate possible alternatives for reducing noise exposure. NIRS has its own companion program called NIRS Screening Tool (NST). NST is used for quick noise impact assessment due to simple air traffic changes without running the full-scale model. Single noise events can be described with Maximum Sound Level or Sound Exposure Level. Maximum Noise Level (Lmax) measures noise at its highest level during one noise event. 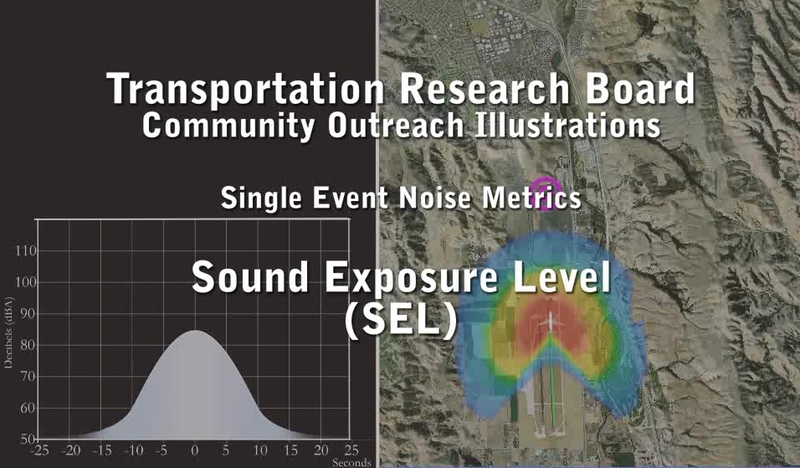 Sound Exposure Level (SEL) represents the total sound energy taking place during a flight event. This level is normalized to a one-second duration. It is typically significantly higher than the Maximum Sound Level recorded during a flight event. It can be thought of as the decibel level of a noise event of 1 second duration that contains the same energy as a different event of different duration. It can compare noise events of different durations and strengths. For example, a long "rumble" may represent a higher SEL than a very loud "bang". SEL is not the amount of noise actually heard by a person. It is a measurement of the total sound energy during a noise event. Lmax and SEL measure one single event. Cumulative measurements are taken to include all of the noise events and duration into one rating. This is the average sound level over a time period. The noise data may be unweighted when collected. It is then weighted using an A-weighted scale. Similar to the LEQ, the Day Night Average Sound Level (DNL) is a measurement taken over 24 hours. The DNL is different from LEQ, because it gives a penalty to operations taking place at night between 10pm and 7am. This measurement is used by federal agencies including the FAA. 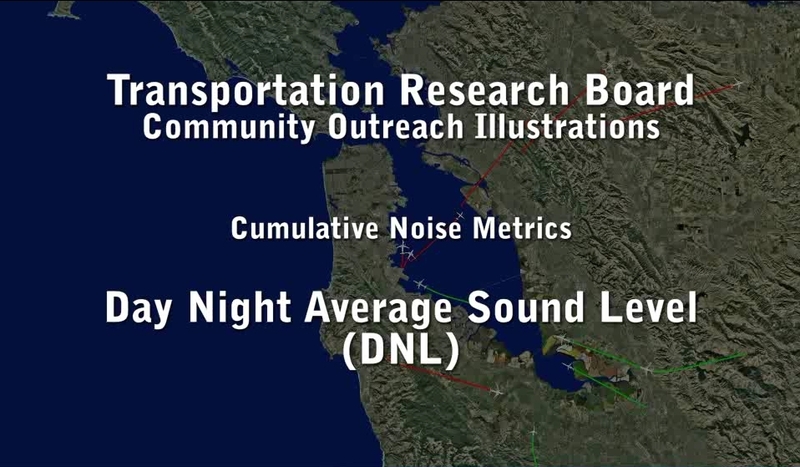 A somewhat different form of DNL, called Community Noise Equivalent Level (CNEL), is used in California with even higher penalty to night flight operations. To create DNL or CNEL contours around the airport in Part 150 studies, the Aviation Environmental Design Tool (AEDT) has to be used. All of these measurements are used to help predict the response of the community to noise exposure. For example, the Schulz and Miedema annoyance curves relate DNL to annoyance with an equation. This equation can be used to convert DNL contours to annoyance contours. The contours can then depict the percentage of the population in different regions that will be highly annoyed by the noise level. By using these well-established relationships between noise metrics and the effects of noise, residents can more easily understand the noise exposure in their communities. In addition, residents can communicate more effectively with policy makers. Examples of noise contours, the use of metrics and relevant case studies can be found in the following flight track plots and case studies. contour map, Day Night Level (DNL or Ldn), Federal Aviation Administration, helicopter, noise contours, noise, rotorcraft, runway.